We Newfoundlanders and Labradoreans know too well how deeply the sun set, and of the profound impact of the ensuing war on the Dominion of Newfoundland, its sons, and daughters. Dinner theatre, as a form of entertainment, is meant to be as easy to digest as the strawberry shortcake that’s served with it. How, I wondered, could dinner theatre be used to tell the story of the saddest tragedy in the history of Newfoundland and Labrador? Now celebrating 20 years of operation, I’m certain Spirit of Newfoundland, in all its years, never mounted a production involving something as delicate as the story of the Newfoundland Regiment at Beaumont Hamel. To this day, what happened on that bright July morning outside the tiny French village, stirs the viscera of many Newfoundlanders and Labradoreans. The intimidating work of creating Spirit’s, “Where Once They Stood,” (playing July 12, 13, 14) was left to Peter Halley, Keith Power and John Williams. After looking at each other and likely saying, “Are we crazy to be doing this?” I’m sure they must have struggled with finding the right balance between humour and pathos. The music would take care of itself. However, dinner theater isn’t dinner theatre without comedy. But, what’s funny about a catastrophe? Finding the correct amount of fun, and injecting it respectfully, was important. Halley, Power and Williams succeeded beautifully in this. One of the most seamless examples is a scene where two soldiers, played by Power and Williams, discuss writing letters to the folks back home. When Power’s character admits he doesn’t know how to write, but wants to send a letter to his mom, Williams offers to write his letters for him. Their poignant conversation is followed immediately by a scene where the son’s first letter is received by his mother and father, played by Shelley Neville and Peter Halley. Much laughter results when it becomes obvious the kind friend has taken the opportunity to praise himself to the hilt and request chocolates from the young soldier’s parents in the bargain. The exception, that allowed for the telling of our regiment’s participation at Gallipoli, and the inclusion of Eric Bogle’s “And the Band Played Waltzing Matilda,” (performed with great tenderness by Peter Halley and Sheila Williams) was a 1975 Dardanelles Campaign 60th anniversary celebration at Scruffy Murphy’s pub in Sydney, Australia. Thanks to full cast and audience participation in “Tie Me Kangaroo Down Sport,” it became one of the production’s most boisterous scenes. Dinner theatre stagecraft allows the theatre itself to seamlessly become part of many scenes. Before and after Spirit’s auditorium became Scruffy Murphy’s, it was the pre-war and post-war CLB Armory. Actor, John Williams, played both Australian and British masters of ceremonies, managing credible accents for both. “Where Once They Stood” carved out a significant role for women players. It made sense, given the tremendous support the war effort received from women at home and abroad. On the home-front, they replaced men in the workforce, while raising families and managing households. They wrote letters, knit socks and sewed shirts for soldiers; and, they were the ones who stayed strong for everyone else. 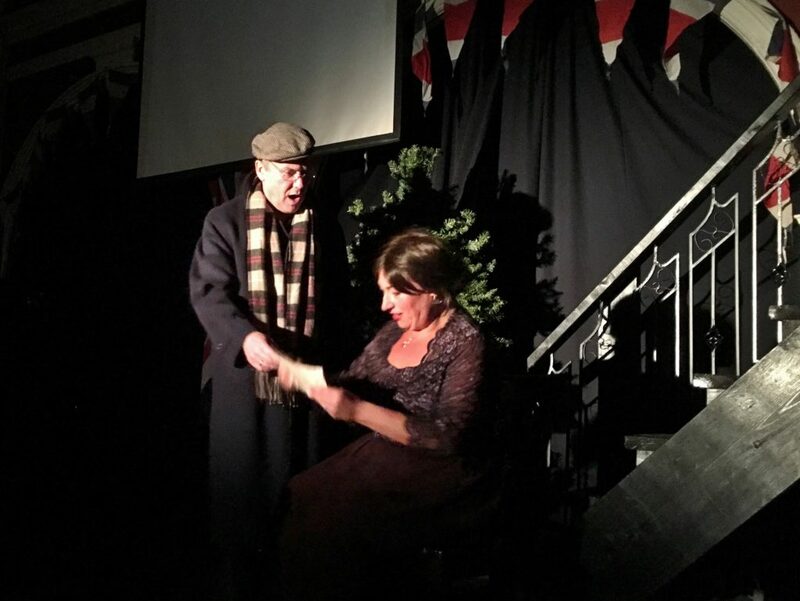 The production also gave performers, including veterans Sheila Williams and Peter Halley, an opportunity to show some acting range in heart-rending dramatic monologues, a device used to carry the narrative forward. These contrasted with lighter moments such as Shelley Neville’s and Sheila Williams’ tongue twisting duet, “Sister Suzie’s Sewing Shirts for Soldiers,” and a version – with some choreographed shimmying – of “The Maple Leaf Forever,” sung to Newfoundland troops, mistaken for Canadians, by an English ladies welcoming committee. I’d be remiss if I didn’t mention two scenes that made me, and I suspect other audience members, choke-up. One was near the beginning, the second at the end. 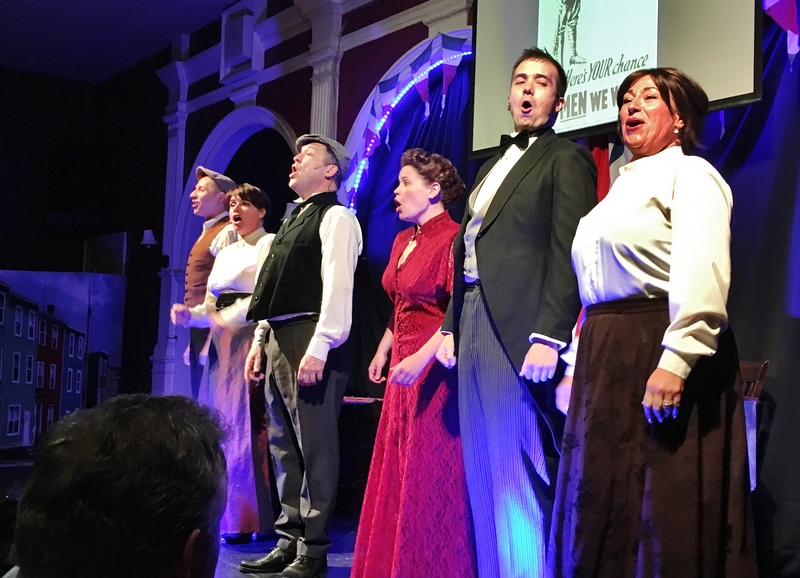 As the young Blue Puttees marched off to the strains of “Keep the Home Fires Burning” and towards the vessel that would take them to England, two mothers – Sheila Williams and Shelley Neville – show the heartbreak that all mothers must feel when confronted by the reality of their children going off to a war, from which they may not return. 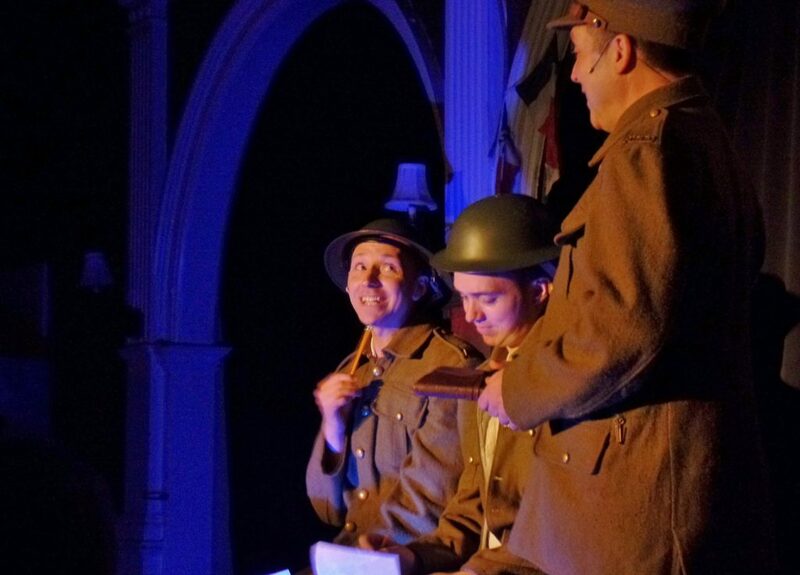 The second scene, played by Keith Power, John Williams, as young infantrymen, and Peter Halley as commanding officer, takes place on the eve of the Battle of Beaumont Hamel. Two very scared young men look to their superior for comfort and reassurance. “Sir, are we going to be okay?” An answer is given, beautifully, and with compassion. One sentence of the officer’s response contained the most powerful 10 words of the entire production. “I think we are going to be better than okay,” he said. Spirit of Newfoundland, as usual, employed some of the city’s finest musicians for this show. Bill Brennan played piano, Frank Fusari, strings and percussion. Honorable mention goes to John Williams, who, along with his writing and acting, played a mean trombone in one of the CLB Armory scenes. Chef Alex Pierson and Spencer Mulrooney prepared the evening’s meal, which began with Spirit’s seriously good sourdough bread – “made with a 282-year-old bread starter that was brought to Newfoundland in 1999.” There’s nothing light and flimsy about it. It has substance and flavour. A salad course featured summer spinach, julienne yellow and orange pepper, shavings of roasted beetroot and grated smoked cheddar. Toasted cumin and lemon vinaigrette gave the salad extra zip. We were given a choice for the main course: cod satay or roasted, bone-in chicken breast. It was the first time I’d seen an Asian twist employed with Spirit’s cod. The hoisin sauce gave the fish a sweet, gingery flavour with slight tang. Despite having to turn out a massive number of plates, Pierson and company produced cod that was flaky and moist. I’m always happy to be served chicken on the bone because, invariably, it has more flavour and juice. Spirit’s came with a stuffing of caramelized onions and sautéed apple. Delicious mushroom gravy made the meal taste even better. Chicken and gravy cries out for fluffy mashed potatoes. Potato would have been enough produce for me, but complementary carrots and broccoli were good too. Appetizer and mains were served before the performance began. Dessert arrived during intermission. Spirit’s Screech cake, which I’ve tasted many times, was presented a little differently. This time it was drizzled with caramel sauce, and a spoonful of partridgeberry gastrique. It got no complaints from me.